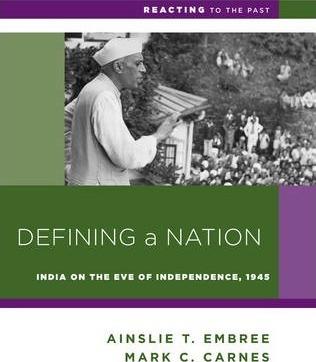 Defining a Nation is set at Simla, in the foothills of the Himalayas, where the British viceroy has invited leaders of various religious and political constituencies to work out the future of Britain's largest colony. Will the British transfer power to the Indian National Congress, which claims to speak for all Indians? Or will a separate Muslim state-Pakistan-be carved out of India to be ruled by Muslims, as the Muslim League proposes? And what will happen to the vulnerable minorities-such as the Sikhs and untouchables-or the hundreds of princely states? As British authority wanes, tensions among Hindus, Muslims and Sikhs smolder and increasingly flare into violent riots that threaten to ignite all India. Towering above it all is the frail but formidable figure of Gandhi, whom some revere as an apostle of nonviolence and others regard as a conniving Hindu politician. Students struggle to reconcile religious identity with nation building-perhaps the most intractable and important issue of the modern world. Texts include the literature of Hindu revival (Chatterjee, Tagore, and Tilak); the Koran and the literature of Islamic nationalism (Iqbal); and the writings of Ambedkar, Nehru, Jinnah, and Gandhi. Ainslie T. Embree is professor of history emeritus at Columbia University and former president of the American Institute of Asian Studies and of the Association of Asian Studies. He also served as Counselor for Cultural Affairs at the American Embassy in Delhi. His books include India's Search for National Identity, Imagining India, and Utopias in Conflict: Religion and Nationalism in India. He was also editor-in-chief of the Encyclopedia of Asian History. Mark C. Carnes is professor of history at Barnard College and creator of Reacting to the Past. He is the author of many books in American history and general editor of the 26-volume American National Biography, published by the ACLS and Oxford University Press.